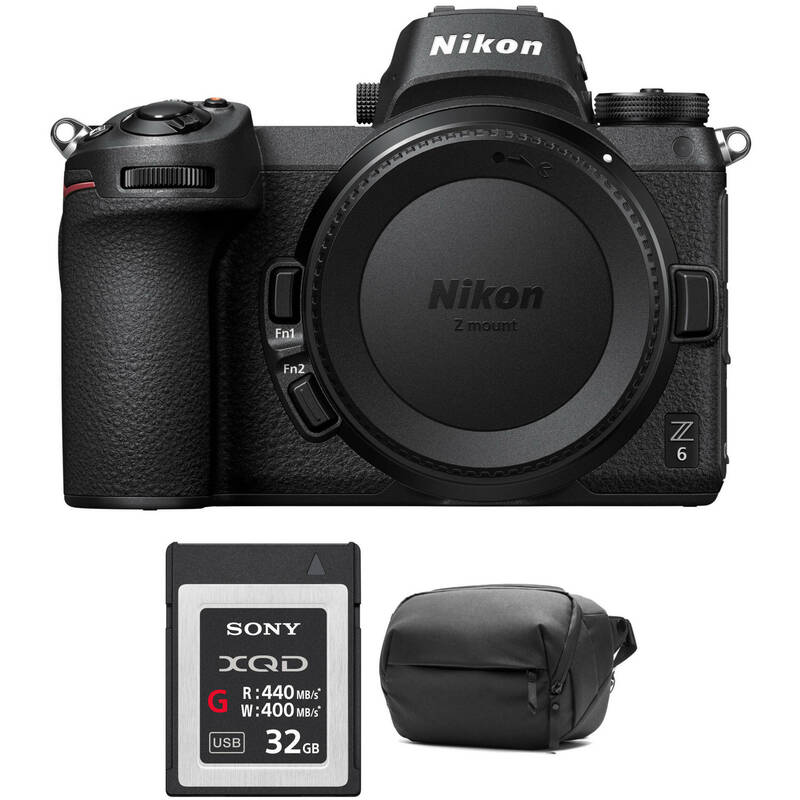 Comprising the essentials needed to begin shooting, the Nikon Z 6 Mirrorless Digital Camera with Accessories Kit from B&H bundles the sleek full-frame mirrorless body with a memory card and a protective camera bag. Box Dimensions (LxWxH) 4.331 x 3.937 x 0.63"
Z 6 Mirrorless Digital Camera Body with Accessories Kit is rated 4.7 out of 5 by 88. Rated 5 out of 5 by Cecil from MUCH BETTER THAN THE REVIEWS I have used the Z6 for 4 weeks and its BETTER than most reviews. Easy controls, solid feel, GREAT image quality, better than good autofocus. Not a D500 for Wildlife but solid images of non flight birds. Excellent portraits.... I probably will use it as my number 1 camera. I own Fujifilm xt3, (Z6 better controls), Nikon D500 (my sports & wildlife camera) & D850 (Z6 fits my use better than D850. I know that sounds crazy but that whats makes us all different). I dont use any of my cameras for video.... Good to above average battery life for a mirrorless camera. Lightroom now has added the Z6 so .nef files can be converted. Rated 5 out of 5 by David from Incredible Camera After living with a D5000 for 10 years I decided to make the move to a full frame mirror-less. Best decision I ever made (camera-wise). With this camera you can shoot full manual mode with complete confidence. I shoot a lot of horse shows and the focus is spot-on tracking over the jumps. Even though the camera I was using before was an entry-level DX from ten years ago the menu system in the Z6 felt comfortable from the start and the button locations on the camera were easy to adjust to within the first day or two. Wish it had the auto-eye focus of some of the other models for portraiture but honestly for 95% of what I do the Z6 is perfect. Rated 5 out of 5 by Timothy from Great camera! Last fall I followed the breakout of this camera, I have a Nikon camera that I got back in 05. I am by no means a pro, but I love to the hobby.I decided to make the plunge on the Z6. The build quality great, the touch scene is very easy to use.If you watch a couple U-Tube videos they will make understanding the new camera easy.The touch screen has a great look and is very informative.I love the ability to custom set the buttons and controls, you gotta love technology ! The Z6 is all the camera the average photographer will ever need and more. I would highly recommend you make the purchase , not cheap , but you get what you pay for! Enjoy! Rated 5 out of 5 by Matthew from Best Option for Hybrid Shooters - Night Photography & Video I am primarily a night photographer. OK, well I was 100% a night photographer with my D750 since video wasnt so great with that body. With the Z 6, I can have the same or better quality with High ISO / long exposure still photography PLUS in-camera 4K video. Why does that matter to me? Gosh, I go such wonderful places, it would be a crime to not make some video of it, too. And I also am an educator, so creating both free and for-pay videos is something I want to do to grow my business. So with a Z 6, my F Series lenses (for now...) and an Atomos Ninja V, I am ready to do ALL of the things I want to do. And that matters to me very much. I am very happy. Delighted that Nikon made the camera that fits my current needs. Rated 4 out of 5 by Manuel from Nice, light, and my Nikon glass works great with the adapter I pre-ordered this camera and adapter combo hoping it would arrive in time for a long planned trip end-December to Mid-January. It arrived around the end of November and I did some test shot and was very happy. Took it on my trip through Malaysia, Singapore, and New Zealand instead of my heaver D800, with the 28-300 and 24/f1.4 glass I already have. With a couple of caveats, I was pleased with the performance. Battery life isnt great, but since it uses the same battery as the D800 I took a spare. But if you dont have another EL15, I would order an extra one for it. Biggest issue is the wandering focus spot. I had to keep re-centering it. Only 4-stars because of that. Hopefully Nikon will come out with a firmware fix soon. Rated 5 out of 5 by Gary from The BEST!! Love the Nikon Z6 and 24-70mm new lens. I have been shooting Nikon since 1990 and have had many of their bodies. This camera is a joy with so many features, amazing v viewfinder and monitor which is liked a smartphone color screen, the quickness of focusing and when I use the adapter for F mount lenses, the pics come out perfect. If some reviewers complain about only 1 slot for a memory card, carry more than 1 QXD card and change cards. B & H sales rep Hyman gave me outstanding service and answered all of my questions prior to my order being submitted. Quick next business day FedEx delivery was included. Rated 5 out of 5 by Randy from Exceptional clarity Have 30 years experience with Nikon professional-level cameras. Photos taken with the Z6 are as sharp as, if not sharper than, those taken with my D800 and D4s using the same lenses. While many controls on the Z6 are very similar to those of a D800/ D4s, getting used to the differences takes a little time. Would recommend having one extra charged battery for every hour of extensive photoing - the camera does seem to use up battery life faster than D800/D4s. The Z6 is certainly smaller and much lighter than D800/D4s. The attached photos, one cropped and one as taken - were taken with the Z6, 600mm F4 lens, TCIII 1.4 teleconverter, gimble head, and tripod. The birds were at the top of an 80 ft tree. The tree was approximately 200 yards distant. Rated 4 out of 5 by DeMarcus from Firmware update from greatness Nikon almost hit it out of the park with the Z6. Almost, as in, needing a firmware update to address focus tracking wandering and making it a more streamlined process. Also, in a firmware update, Id like to see Nikon address color noise in low light images (as in storm clouds near sunset). Not to mention, an update to remove/or make an option to NOT apply color profile settings to its RAW files. Perhaps, this is the cause of the color noise even at 100 ISO. These issues can simply be corrected with a software update. Once that is fixed, this will go from being a very good camera system to being a great one. It wont replace a DSLR in terms of performance and speed, but it DOES make shooting fun again.